Tim Ferris is best known as the author of the The 4-Hour Workweek , which is a minimalist approach to “escaping the 9-5, live anywhere, and enjoy the new rich”. It’s a fantastic book that I would rank in my Top 10 most influential books I’ve read, maybe even Top 5. So with that said, how does the The 4-Hour Body hold up? Did Tim translate his impressive research, analytical, and outside the box thinking to crack the code of transforming the human body? 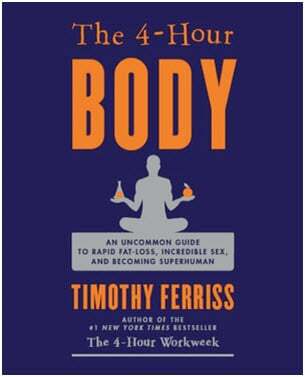 First off, this is not an easy book to review because the 4 Hour Body is not a book, but more like 3, or 4 books in one. In the introductory chapter, Tim lays out “5 Rules” on how to read the book, the first of which warns the reader to, “Think of the book as a Buffet”. The 4-Hour Body is like a reference on all things related to the extreme of body change and performance that should not be read all in one shot. Including the Appendix, this is a monster 590 page book that is very dense at times even for the most eager reader. Now with all that said, I’m going to go into the pros and cons of the book so you can determine if it’s worth your time and money to purchase and read it. 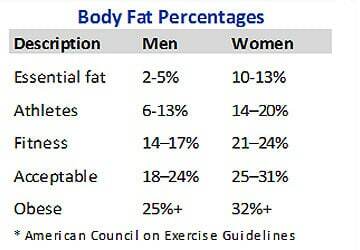 I’m going to pay particular attention to the Fat Loss and Muscle Building sections, which comprise about 40% of the book. Leverages the knowledge of experts – It is undeniable that The 4 Hour Body is a very impressive tome that represents thousands of hours of research and experimentation that only Tim could pull off. The depth and breadth of the book in my opinion is astounding. The reason why much of the information is so deep is because Tim was able to access the top fitness researchers and experts in the world on a whim. Many of these experts provide detail that could only be based on years and years of experience and devotion. For example, Tim discusses advanced muscle building strategies with Dave Palumbo who is a smart and accomplished 300 pound bodybuilder who literally interviews and coaches bodybuilders all day long. It’s very valuable for the everyday consumer to be given access to these experts where it would be exorbitantly expensive, or simply infeasible any other way. Tons of interesting tidbits – Would you like to know how you can sleep for only 2 hours per day and function normally? What about how to assess your functional movement? Or how you can increase your vertical leap a couple inches in 5 minutes? There are tons of small tips and tricks littered throughout the book that are interesting and thought provoking. At the end of every chapter is a “Tools and Tricks” section which gives links to more information and relevant products. It may be worth buying the book just to use it as a reference, which is what I ultimately think Tim really wants. Covers a vast array of fitness topics in detail – Most fitness books do not address the entire scope of health and fitness, from power, to strength, to speed, to endurance, to injury prevention. The breadth of information as it’s presented gives the reader a more complete view of the human body and any facet that can help improve it. At times the breadth of the book feels overwhelming, but again, it’s meant to be a reference material. There is no cohesive strategy to lose fat, increase strength, and improve overall health & well-being – If you are looking for a sustainable plan to help you lose fat and improve your health, The 4 Hour Body may not be for you. The problem is that whether it’s building muscle, increasing strength, running long distances, or losing fat, or improving longevity, many of the eating and training approaches contradict each other, which can be confusing. What you are left with is an amalgamation of eating plans and training programs that attempt to isolate and maximize a specific training effect, or outcome. Several strategies are very difficult to implement – The most important part of developing a fitness, or nutrition plan after safety is adherence. In other words, are you actually going to do the plan if given to you. Some of the approaches in the book are quite extreme and very difficult to implement. 00.00-10.00 minutes – Up to mid-waist, legs submerged, torso and arms not submerged. 10.00-15:00 minutes – Submerged up to neck with hands out of water (sitting cross legged then reclining makes this easier in a standard bathtub). This excerpt gives you a flavor for how the book is written. Finally regarding the fat loss section, the main advice is to follow the “slow carb” diet, which is low carb diet that allows only fibrous vegetables and legumes as carbohydrate sources. For some, it can work wonders, for most, it’s tough to follow. Largely based on self-experimentation – In addition to expert input, the book is based on Tim’s obsessive self experimentation, which ranges from drawing blood with needles 6 times per day to measure his blood glucose levels, to eating beef and nuts all day long to help boost testosterone. While Tim is able to come up with some interesting and exciting conclusions based on his own research, we cannot assume what works for Tim will work for me, or you. One thing that has become clearly evident to me as I’ve been running a personal training and nutrition counseling practice for years is that two people can respond completely differently to the same approach. For example, Tim discusses how eating any fruit whatsoever halted his fat loss goals (such as drinking orange juice in the morning), when I’ve personally never come across that issue before, nor have any of my coaching/private clients. If you’ve read The 4 Hour Body, let me know what you think. I bought the book after Christmas and started following it January 19th. I agree with everything you wrote. The way I looked at it, take away from it what you want. It should be treated more as a handbook on self experimentation than a how to. I started at 230lbs and consistently lost 12lbs and 2%each month four months. After four months I got sick of beans and switched to full paleo and introduced fruit. During those four months I did no cardio and strength training twice a week. The only muscle loss I noticed was in my legs. Today I am down 70 lbs and am at 19% bodyfat trying to get to 15%. @Jaime – Wow, that’s impressive. Thanks for sharing! I read the book, I enjoyed it, even though I found it a bit hard to read at times as you said Tom is a little OCD. A lot of the advice he gives definitely makes you think outside the box, but it will not always be easy for an average person to follow. A few things I wasn’t too crazy about were the binging on food part, and taking supplements that I personally never heard of, the Idea of doing air squats in before my meals wasn’t too appealing either. But overall I still enjoyed reading his book. This diet works for fat loss. Just using the basics of the diet, meaning – eat only veg, protein, beans 6 days a week – no supplements, no exercise – I lost 17 lbs in the first month. I was shocked and delighted. The second month I added kettle bell swings 3 times a week for 15 min, lost more fat and looked like I was spending plenty of time at the gym. I’m not suggesting this way of eating is healthy long term because I don’t know if it is. Now I’m happy with my weight/size and follow the diet only two days a week to maintain. The point is, if you want to lose fat off your body this diet works. The basics of the diet are not complicated. When I hear “experts” attack this diet it’s frustrating because I know it works exactly how Tim Ferris (the author) says it will. Yes, Ferris goes on technical tangents and wildly digresses in some chapters but the few chapters dedicated to the basics of the diet are simple and IT WORKS. Pros: For losing fat, this book definitely worked for me. I started at 188lbs in early November 2011, and I’m at 151lbs now. I’m open to the fact that I could have lost the weight sooner if I had engaged in the advanced part of the fat loss section, but to be quite truthful, extreme body temperature changes and taking ice-baths kind of freaked me out. In terms of the diet itself, I followed it pretty religiously. I did not make too much effort to exercise, I would on occasion and recreation. Though it is perhaps a more difficult diet to adopt than Ferris will admit, will power, and attention to detail (especially in those fist couple weeks), it really is quite simple. Cons: Controlling energy levels is difficult, as Ferris admits happens to some on this diet. Take his advice on the electrolyte supplements. Even then, it is very important to stay very hydrated, which of course makes you have to go to the bathroom a lot. (I have noticed a more preferable energy status on the weeks I did decide to do a couple days of light cardio workouts). Though some may not care, you may want to avoid going out to dinner with friends and family (definitely bars) on days that are not your cheat day, unless you want to be THAT person who has a dozen picky things to annoy your server.